Seen while using Backup Exec 2010 R2, while attempting to backup an Exchange 2010 server (on Windows server 2008 R2) in a VMware virtualised environment (using the VMware Backup Exec Agent). Final error: 0xe0009585 – Unable to open a disk of the virtual machine. V-79-57344-38277 – Unable to open a disk of the virtual machine. This involves two reboots of the target machine start planning downtime, or warning your users. 2. Start > run > appwiz.cpl > Locate and uninstall the VMware tools > when prompted to > reboot. 3. 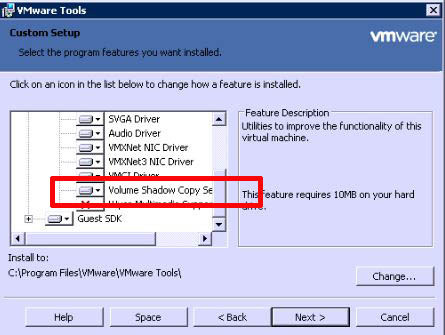 Reinstall the VMware tools but this time choose “CUSTOM INSTALL” > Locate the “Volume shadow Copy Service”. 4. 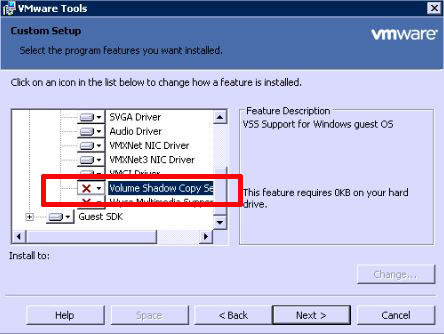 Change the drop down so that this option will not be installed > complete the VMware tools installation and reboot when prompted.